In Stock, ready to ship today. One Year Exchange Warranty. A 05:10 error on the front panel of the printer indicates a formatter card failure. This issue usually does not require on-site service, as the formatter card is a user-replaceable part. The designjet 500, 510, and the 800 all have what are called a GL/2 Accessory Card or Formatter Board installed. Both terms refer to the same part. These board provided advance CAD features and expanded memory. It is not uncommon for them to become defective and need replaced. The feedback I get from customers is that the main cause of the error is the printer is left on continuously. Resulting in a power surge thru the line that corrupts the ROM chip. Make sure to check your ground to neutral reading on your outlets. Faulty wiring will result in more errors. If you are getting a 05:10 Error Code -- You Must Replace Your GL/2 Accessory Card or Formatter Board. A 05:10 error on the front panel of the printer indicates a formatter card failure. This issue usually does not require on-site service, as the formatter card is a user-replaceable part. It is a simple fix. The card is located on the back side nearest the power cable plug. There are two expansion cards. One is the network card. The GL/2 card is labeled and needs to be replaced. Simply unscrew it and slide out of the slot. Please confirm that you have a Designjet 500 printer. The 500 GL/2 Card will not work in a Designjet 510 printer. I have had several customers with a Designjet 510 purchase the 500 GL/2 Card. The 500 GL/2 Card does not work in their printer. This will caused delays with exchanging the 500 card for the 510 card. Designjet 800 has nearly ten different part numbers. Turn the printer off and unplug the power cable from the back of the printer. Remove the HP-GL/2 accessory card and re-install the HP-GL/2 accessory card. 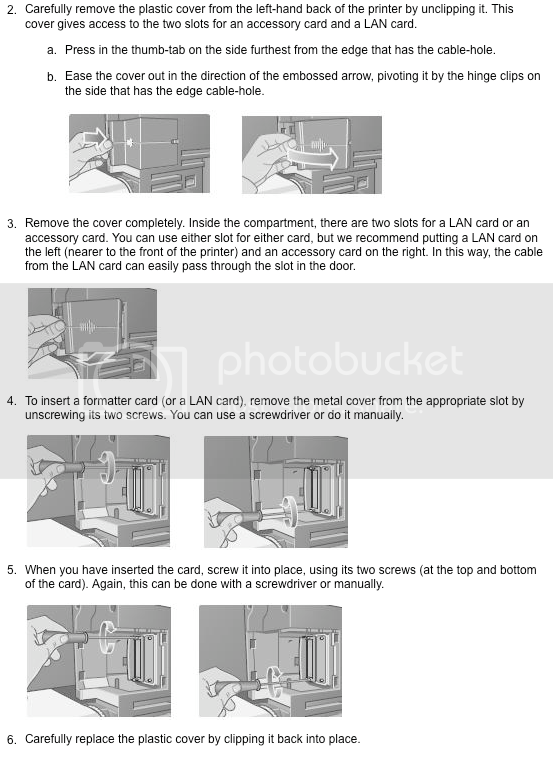 Click here for detailed instructions on HP-GL/2 accessory card removal . Plug the power cable in, turn the printer on and attempt to verify functionality. If the problem persists, click on Support at the top of the page for additional HP support and contact options. I was an HP Customer Engineer from 1995-2002. During this time, I serviced contract and warranty calls within the Northern Indiana area. When I left HP, I took my Designjet service experience and started my own business servicing out of contract plotters. Designjetpartsfast.com was launched in 2009. With over 19 years Designjet experience, I can help you resolve issues you are experiencing with your Designjet Printer.